Audet & Partners, LLP is currently investigating claims on behalf of homeowners, business owners and others who have suffered various losses, economic and otherwise, as the result of the extensive Sonoma County fires that spread through a 220,000 area area in October 2017. In particular, we are investigating claims as part of a Sonoma County Fire Lawsuit that may potentially hold PG&E Corporation, as well as Pacific Gas & Electric Company (“PG&E”) and others legally responsible for the devastation experienced by individuals and businesses in and around Sonoma County. Information has surfaced, including a suspect safety history of PG&E, suggests that PG&E may have failed to take adequate and reasonable precautions to protect area power lines from escalating and extremely high fire danger after an extensive drought followed by record-setting rain last winter, followed again by a dry summer in 2017. Reports suggest that these environmental factors were widely known to have created extremely perilous fire conditions at the time of the Sonoma County fires. 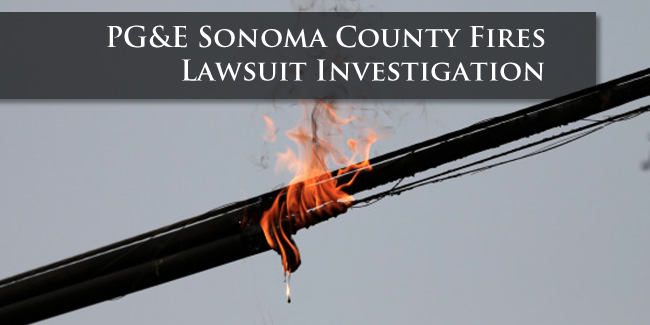 More specifically, it has been alleged that PG&E may have, or at least should have, been aware that extensive vegetation resulting from last winter’s rains were quickly encroaching on Sonoma County power lines, thus creating an extremely high fire hazard in the area. Despite this situation, it has been alleged that PG&E failed to adequately maintain safety on and around its power lines, and that this negligence was a substantial or primary cause of the Sonoma County fires. If you have suffered losses – including personal injury, property loss or adverse impacts to your business – as a result of the Sonoma County fires, you are urged to contact us for a free, confidential case evaluation to assess your potential claim in a Sonoma County fire lawsuit. You can contact us either by completing and submitting the online inquiry form on the right side of this page, or by giving us a call at our dedicated helpline for Sonoma County are victims at (888) 458-4138.